I recently tried a new pumpkin bar recipe that was really good. I found the original recipe on CookieMadness. We all really liked the bars, but as cheesecake is one of my favorite desserts, I think that next time I make these I will go heavier on the cheesecake marbling. It looked really pretty, and the cheesecake swirl helped make the bars wonderfully moist, but the cheesecake part was not a real stand-out flavor. 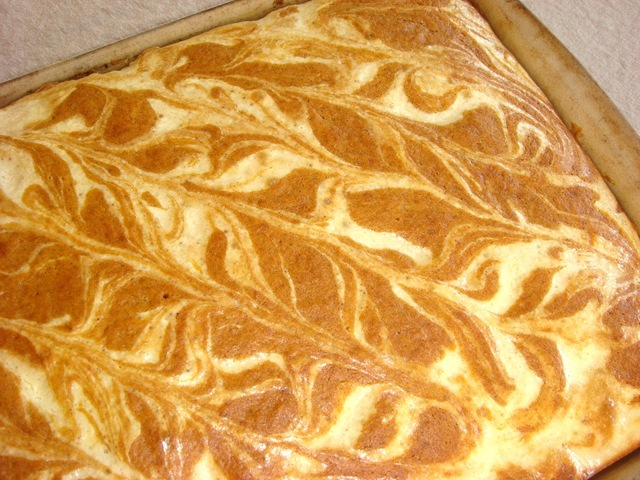 These bars are made by preparing a pumpkin batter, which is spread into a 15×10” pan. The cream cheese layer is added to the top and then run through with a knife to create the swirled pattern. An easy way to create a swirl is to start in one upper corner and run the knife back and forth diagonally across the pan to the opposite lower corner. Then start in the opposite upper corner and run the knife diagonally the other way. Doesn’t that make a gorgeous swirl! Below is the recipe that I adapted (a little) from CookieMadness. Next time I will add more of the cream cheese batter (maybe double). UPDATE (10/11/2011): My daughter made these last night with double the amount of the cream cheese batter. They were great! I will be making them that way from now on. Preheat oven to 350°F. Spray a 15×10 inch pan with cooking spray. Pumpkin Batter: Mix together the butter, salt and sugar. With a mixing spoon or whisk, beat in eggs, pumpkin, buttermilk and vanilla until well blended, scraping down sides of bowl as needed. Mix flour, cinnamon, baking soda, baking powder, and nutmeg together; stir into batter. Reserve about 1/4 of the batter. Spread remaining 3/4 of batter evenly in prepared pan. 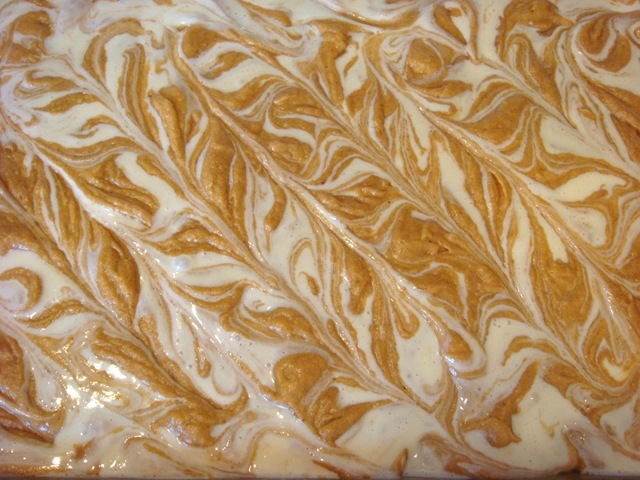 Swirl: In a second bowl, with a mixer, beat cream cheese, sugar and vanilla until smooth. Add egg and beat until smooth. Drop tablespoons of cheese mixture over pumpkin batter, then drag a knife through to swirl. Drop reserved pumpkin batter over the top and swirl again. Bake on center rack until pumpkin batter springs back when touched, about 30 minutes. Let cool completely in pan, then chill for an hour or more. Cut into 24 bars. Thank you for posting this recipe. These bars look delicious! Are these supposed to be like a cake or like cheesecake? I thought they would be like a firm but wet consistency, but mine are definitely like a cake, with the white part being the gooey part. The pumpkin part is definitely cakey. If you bake them in a 15×10″ pan, they are not overly thick, though. A smaller pan will make them thicker and more cakey. Chilling the bars in the fridge makes them a little firmer. 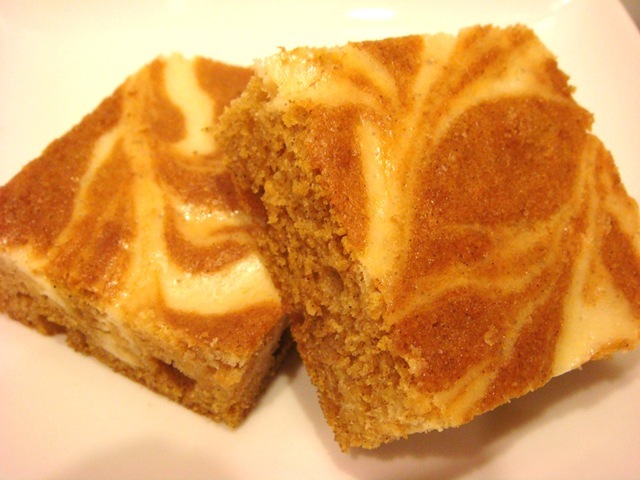 When I baked them this year, I doubled the cheesecake swirl batter and they had more of a cheesecake taste to them. But the pumpkin batter is supposed to be cake-like with the white swirl being more of a cheesecake consistency. Made them, it was definitely like a cake, you can tell by looking at them. I made them in a 11×13 pan was a thick cake, was so good!! !